The welfare of animals at a Warner Bros Harry Potter studio tour is to be reviewed after concerns about their treatment. 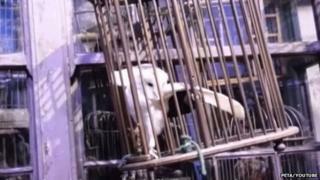 Animal rights campaigners Peta claimed they saw "frightened owls [in] tiny cages" when they visited the attraction in Leavesden, Hertfordshire. Warner Bros Studio Tour London said: "It is essential the welfare of the birds... is of the highest standard." It added it had asked the company which owns the birds to "review this matter". The tour allows Harry Potter fans to meet Harry's owl, Hermione's cat and other "animal stars" from the film franchise. A Peta investigator secretly filmed the attraction, apparently showing handlers encouraging visitors to touch the owls and making them perform "demeaning" tricks. "Confining frightened owls to tiny cages where they can only chew at their tethers in frustration goes against every message of respect and kindness that JK Rowling's wonderful books taught us," Peta director Mimi Bekhechi said. "Peta are calling on Warner Bros Studio Tour London to make sure that the Harry Potter tour stays magical - and not cruel - by keeping live animals out of it." In response, Warner Bros Studio said: "The owls that appeared in the Harry Potter film series occasionally come to the studio tour. "They appear for short periods and are exclusively handled by the experts at Birds and Animals, the company that owns and trains them. We have asked them to review this matter." A spokeswoman for Birds and Animals said: "The welfare of our birds and animals is our number one priority and we want to ensure they remain stress-free and healthy. "The owls are always given regular breaks and closely monitored by a vet. Now that we have had the opportunity to see the footage, we have instigated a review of the issues raised. "We will take appropriate action to ensure that the birds and animals always receive the very best care." The Making of Harry Potter attraction at Warner Bros Studios opened in March 2012. Located where the successful movie franchise was filmed for more than 10 years, the tour features sets, costumes and props from the series.